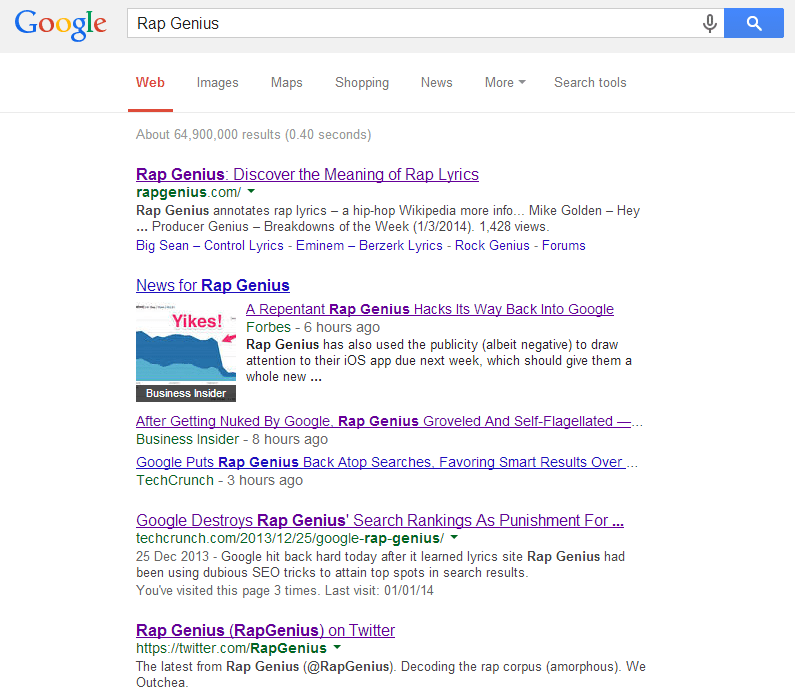 It’s taken just 10 days for annotation lyrics website, Rap Genius, to be allowed back into Google’s search results. 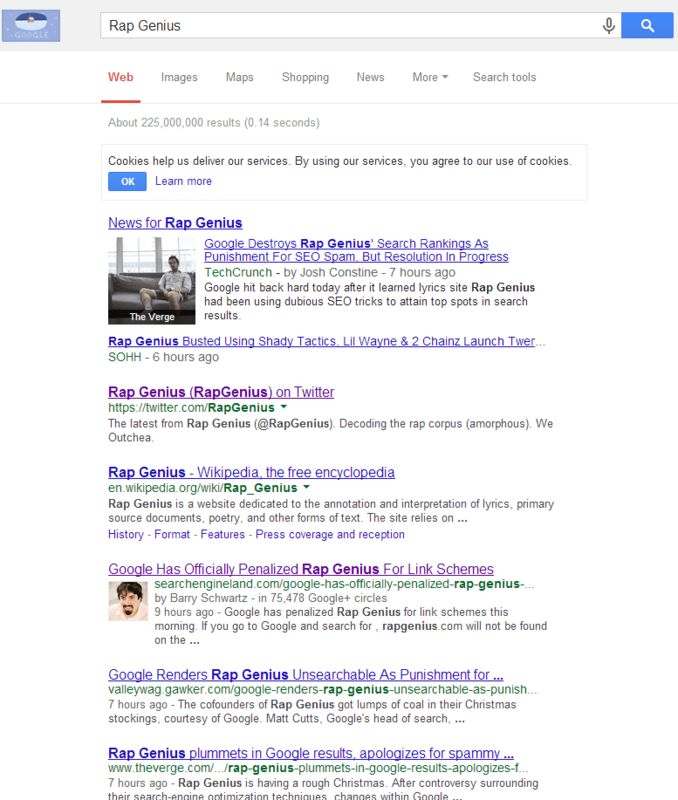 On the 25 December, 2013 Rap Genius was penalised by Google for engaging in “link schemes”. In a long-winded blog post in Rap Genius’ news section, they described how they managed to get back into Google. They explained that they downloaded the RapGenius.com backlink profile and analysed this data by finding websites that would potentially violate Google’s guidelines. They would then either contact those websites by asking them to remove the links pointing to RapGenius or by asking blog owners to add the rel=”nofollow” attribute to those links. For any links they could not get removed or changed they would add to a disavow list, which they would later submit to Google. They delved into the more technical side of what they did to get back into Google’s search results, which included writing scripts to speed up the process of finding sites that were potentially in violation of Google’s guidelines. However, the question remains whether they’ve managed to succeed in gaining back their old rankings for search terms that were lucrative to their success. Either way, it’s time for them to start the analysing process to see what their rankings look like now. Take a look at these comparison screenshots of what the search results looked like when they were first penalised on the 25 December 2013 to their updated status on the 4 January 2014. I found this little nugget. 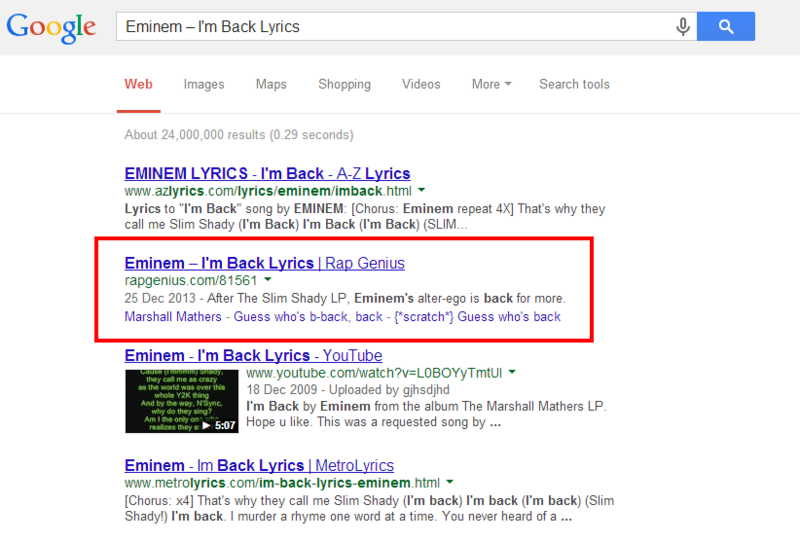 Rap Genius appears to back in the search results for Eminem’s song “I’m Back” It’s listed as second place in the SERP after AZ Lyrics, one of the many other lyrics websites that Rap Genius tried to expose when they themselves were exposed. In my opinion they’ve managed to get back in the search results relatively quickly due to the fact they’ve done quite a bit to find unnatural links, by creating scripts, analysing their backlink profile, and being quite open throughout the whole process. If they did indeed communicate with Google throughout this, then their response is one to mark as an example for other big websites that may in the future go through the same process.